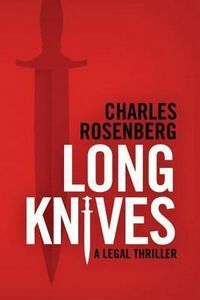 Long Knives by Charles Rosenberg, a Mysterious Review. Review: When law professor Jenna James steps out of her office to take a phone call while meeting with one of her students, she returns to find him unconscious and barely alive, in Long Knives, the second in a series featuring this character by Charles Rosenberg. Primo Giordano has asked to consult with Jenna about a map he had acquired, one that purported to show the exact location of a ship that had sunk off the coast of California with a treasure of gold, and one that he said was in the long red mailing tube he brought with him. Jenna, who taught admiralty law at UCLA, was skeptical about his claim but also reluctant to get involved in providing legal advice to a student. After the paramedics moved Primo to the hospital, she realizes that the tube is missing. When Primo dies as a result of poisoned coffee served to him by Janna and his brother sues her for stealing the map, and at the same time implying she killed him to get it, she turns to her former mentor and another attorney to assist in her defense. Long Knives is subtitled a "legal thriller" but there is relatively little in the way of "legal" here and most certainly not much in terms of a "thriller". That isn't to say the story itself isn't interesting, rather that categorizing it as a "legal thriller" seems a stretch. It is really more of a whodunit than anything else, with Jenna James playing the role of amateur sleuth. As the last person to see Primo before he fell ill and later died, she is, of course, a suspect but there are several other candidates, who might have wanted to see Primo dead, not the least of which is his brother, Quinto. Structurally, the book switches points of view between Jenna and Robert Tarza, her mentor and former employer. The chapters from Robert's perspective do little to advance the plot in any meaningful way and could easily have been edited out, yielding a tighter storyline. As it is, the narrative tends to wander far afield. The "courtroom scene" towards the end that identifies the killer actually occurs in a conference room and is handled well, even though by this point it's clear whodunit if not exactly whydunit (which, it should be said, turns out to be a lame motive by almost any measure). There was clearly some potential here to create a taut legal thriller involving sunken treasure, but the opportunity was wasted on numerous peripheral subplots that serve to detract from the core storyline rather than help develop and enhance it. Acknowledgment: Thomas & Mercer provided a copy of Long Knives for this review.